When we arrived at Asda on Boxing Day, it was rather empty – although the staff car park was almost full. Kelly was so tired that she ended up going in to Finlay’s and purchasing some Monster energy drink – that certainly did the trick, poor girl! Finally it was 9am and the shutters were slowly, but surely, lifting up. Kelly and I made tracks to the George department, where yet again we grabbed more bargain clothes! It’s funny actually, because I used to be a size 10-12, but then kinda realised that I ‘love’ food – so it’s pretty difficult finding those designer threads I once owned in ‘plus sizes’. Anyways, George have some fantastic ranges of clothes. The jeans are cheap and always fit my curves nicely. Also, we bought more pyjamas, which funnily enough were only left in mine n Kelly’s sizes. We decided to get two new dressing gowns, as we had disposed of ours last month. And again, more socks! We had such a laugh waltzing the aisles. Again, nothing in the home ware department caught our eye unfortunately. We did however, decide to stock up on the women’s Lynx gift set – OMG, it smells gorgeous! When we finally returned home, the cats were at the door to greet us. We unloaded our purchases and chilled out for the remainder of the day. Out of everything we purchased, the only thing needing to be returned is a casual sweater which is too big for Kelly, so she pinched mine instead! All in all, we had a fantastic time shopping in the sales. It was such a shame that the Asda home-ware department was just not striking enough for us, but never mind. 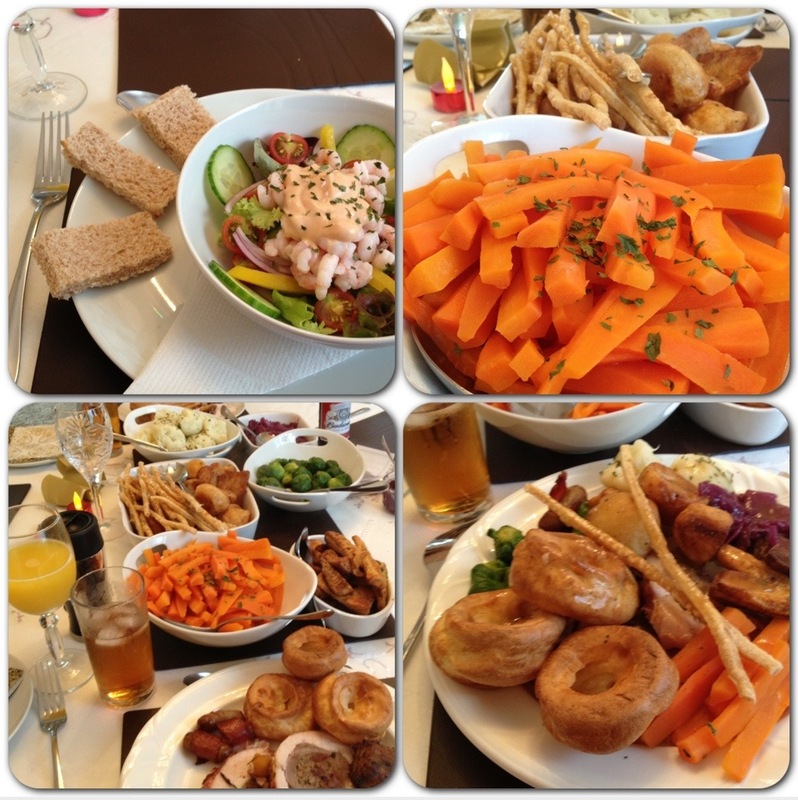 Xmas dinner was beautiful! For starters we had a delicious prawn cocktail with bread fingers. Doris, that’s Trev’s mum, had a lentil soup. She has a strict eating timetable, which has to be met – so she was keen to be fed, god love her! The main meal was simply beautiful. The taste from the meat was like nothing I had tasted before. We had a Marks & Spencer three bird roast which was stuffed with a beautiful fruit stuffing, for me it was moreish! I believe the stuffing was a mix of pork, cranberry, morello cherry and apricot stuffing. The carrots were seasoned to perfection, and mmmmmmm the honey and mustard roast parsnips were gorgeous. The sprouts must of been from the organic breed, because they were huge, and so very tasty! The roast potatoes were golden brown, crispy, yet, light and fluffy in the centre. We also had red cabbage with onion, it was so tasty. Also, we had pork crackling – it was gorgeous, but not suitable for Doris’ falsies. Oh, and the separate stuffing which was served was unreal! I believe it was M&S pork stuffing, you have got to try it – UNREAL! 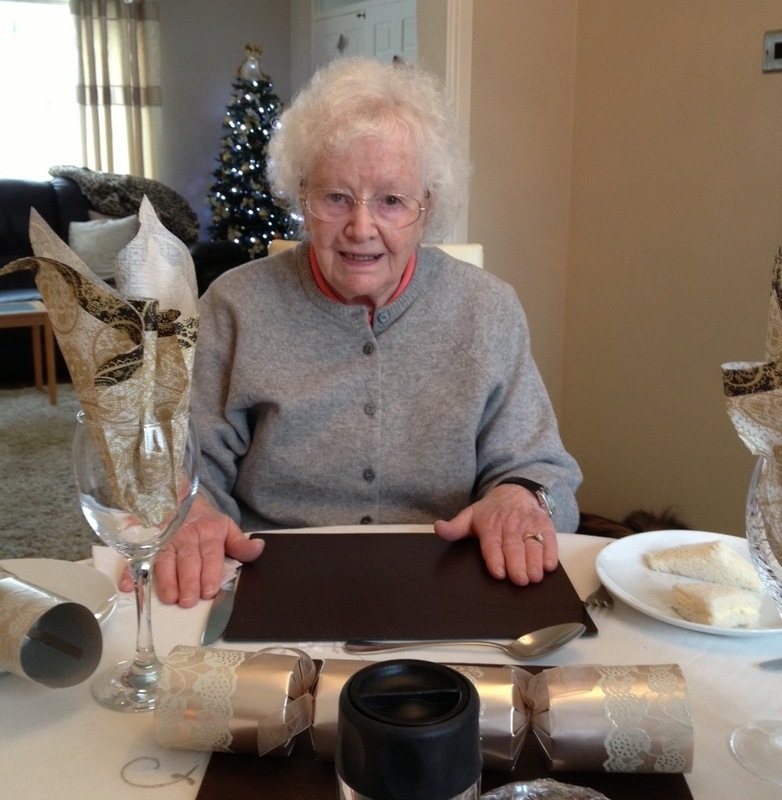 I of course, polished off everything – it was the best Xmas dinner I have ever tasted! Of course, the drinks were constantly flowing and I just couldn’t resist trying out the Sherry with lemonade (which is Doris’ favourite!). Needless to say, I was quite drunk before we even got around to tucking in to our Marks and Spencer Snow Bomb dessert. The cake was beautiful, it had delicious shavings of white chocolate on the outer layer and inside their was a light and fluffy sponge centre which had layers of fruit jam – it was sooo good! Christmas Day Gifts: I did well! So I’ve been a bit of a ‘bad blogger’ over the festive period, my bad! I promise to make up for it though guys. Anyways, let me tell you about my Christmas Day celebrations. Kelly and I ‘always’ get an invite to Kelly’s mums house for Xmas Day. Unfortunately I’m not blessed to be as close to my mother. But anyhow, thats a different story! Kelly and I woke up early, not because Santa had been (honest! ), and we opened our gifts. Diesel and Angel were spoiled rotten with toys, as per usual! Kelly bought me some Nike Blazer trainers, which are awesome! And I also received some perfume, Hugo Boss which is my blast from my school years, and an Impulse gift set. I also received a little present off Kelly’s boss from work – everyone loves me, it seems! I was most impressed with the gift, it was one of those ‘what on earth is it’ presents. It baffled me until I unwrapped it. It was a cream tea light holder. I think it’s made from porcelain, and its just beautiful. The candle, which was included, smells of vanilla – mmmm, my favourite! 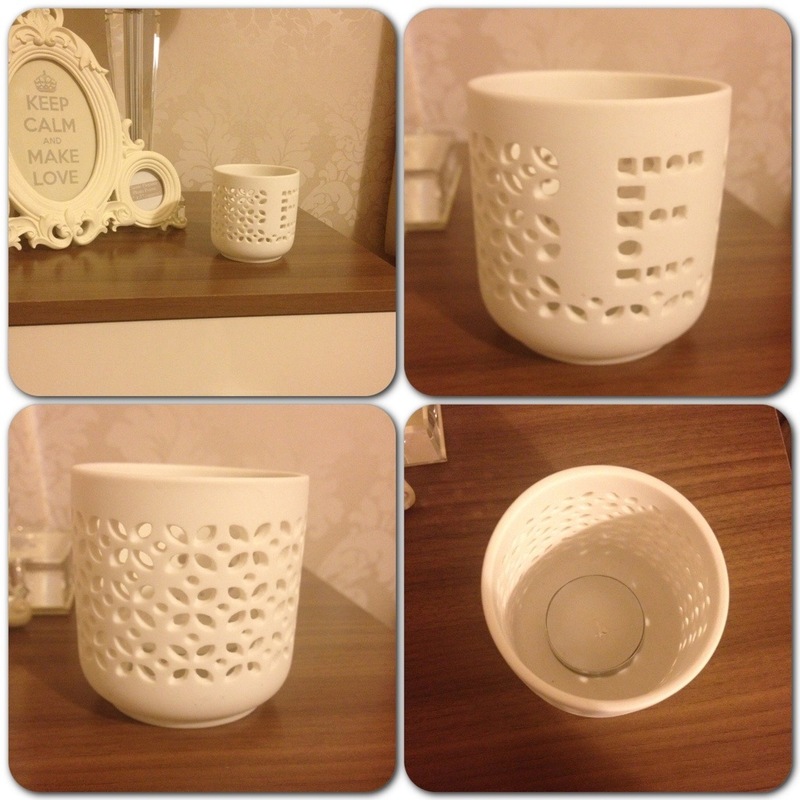 The design of the cream porcelain candle holder is beautiful, it even has my initial on the front of it – sooo personal to myself, and I love it! Apparently, ‘E’ stands for Energetic, Engaging people (or something). 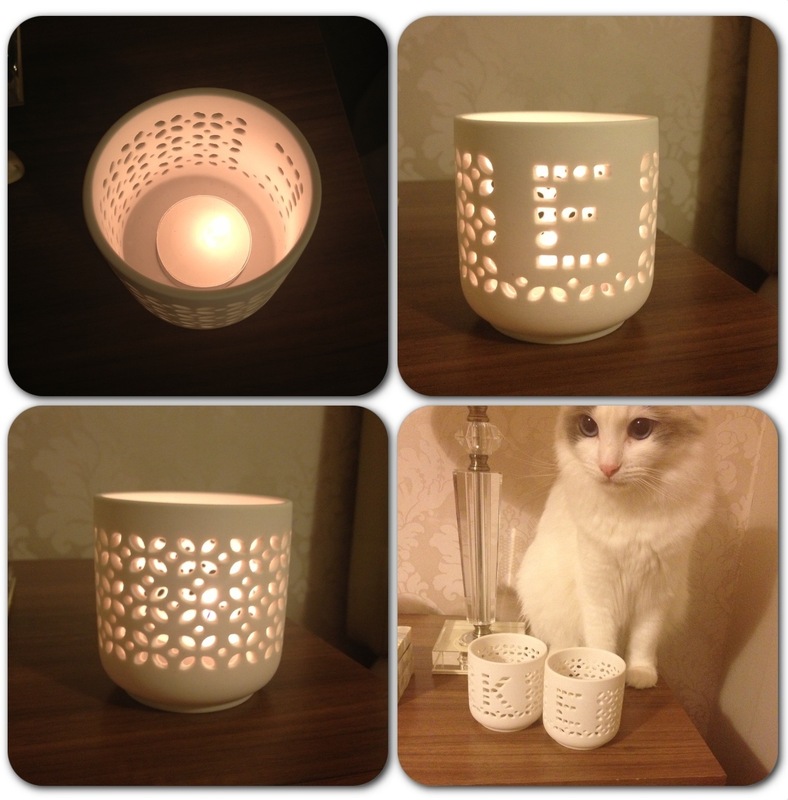 Kelly got the exact same tea light holder, only hers features a ‘K’ on it. We have found the perfect spot for our contemporary tea light holders, which look fabulous on either side of our bedside cabinets. Not only did my gift receiving stop there, when we arrived at Kelly’s mums we were offered various drinks and given a variety of gifts each which included a Me to You onesie, luxurious slippers and a fantastic Soap & Glory gift set (we absolutely love S&G cosmetics!). Next thing, I noticed a small envelope which had my name wrote on it. I opened it and peered inside – £50 in cash for me to hit the sales with, buzzing! Kelly’s mum and Trev are so generous, god love them! My brother, who is a proper ‘mummy’s boy’ was invited to my mothers for Christmas Dinner, pretty shocking considering I/we did not receive an invite – but never mind. Anyways, my brother arrived at Kelly’s mums house with a huge bag full of gifts for Kelly and I. Kelly was spoiled with some Adidas Hi-Top trainers, a black F*** Me I’m Famous Ice-Watch and some Thornton’s chocolates. I however, was very spoiled indeed. I was handed four gifts, and told to open them in a specific order. Firstly, I received a F Me I’m Famous Ice Watch and OMG, a 64gb Apple iPad in white, followed by an official Apple iPad case (in red), and also a brand new leather diary for my desk at work. I was well impressed! Then… Kelly’s uncle Paul and his partner arrived. They dished out more gifts and I received a Ted Baker cosmetic set. We finally got around to sitting at the table for our beautiful M&S Christmas Dinner. So the other day I told you guys about that tasty Scrunch I so desperately desired. I was lucky enough to get my hands on the very last two (I can’t treat myself and not Kelly!). So anyways the Health Warehouse in town, who sell these gorgeous Scrunch deserts, had the Cherry Scrunch on offer – and I just had to have them! And here it is, a Cherry Scrunch. Now, i’m not entirely sure what the process is for making these delicious desserts but check out the close up picture to see the structure of this scrumptious dessert. Shopping Madness: and faulty heater! Well my lovely blogging friends, today I have been given my orders! I’m currently in search of a new cat bed (for Angel and Diesel, from itsapussycatslife – preferably a dog bed, so they can both snuggle up in a roomy yet comfortable space, god love em!) Secondly, they need a brand new cat scratch post – the type with the corked bottom, as Diesel is lazy and doesn’t use the actual scratch post part. Thirdly, we need a draught excluder – preferably two matching ones for the living room! I did actually purchase a Warmlite oil filled electric heater from Argos, but unfortunately it was faulty! So I had a refund issued earlier this morning, and treat Kelly and I to a McDonalds breakfast with Tropicana fresh orange – yummy! Kelly is currently in the process of cleaning the whole flat, in preparation for our Christmas decorations. Mainly, I would like to get the Xmas tree up and decorated at some point today – question is, are there enough hours left in the day? One last thing, seen as it’s almost Xmas, I will be hunting the shops for a cool knitted jumper for Diesel and Angel – you can’t have Christmas for the kids without ‘cheesy knitwear!’ I’m also craving a Scrunch, so I will be purchasing two (one for Kelly and one for myself)! If you don’t know what a Scrunch is, I’ll show you if I’m lucky enough to of grabbed them before they sell out – they sell in minutes! Fingers crossed for the Scrunch desserts guys.